I would like to suggest that some form of interaction be added to the list of things you're required to do before leaving the Tutorial or at the very least it be mentioned in Pink's dialog as a tip for the people who rather not use Internet Links in games they're just trying out (I assure you there are people that finicky; I used to be one of them). Maybe having to exhaust the dialog options being the marker to move on to the "You're free to go now" part of the Tutorial (considering you can spam through the options it probably wouldn't add more than a two-to-three minutes to start-up time for people who are already familiar with this and those who may see it as more of an obstruction than a learning tool). I realize a lot more people may be more intuitive than myself and probably are reading over thinking I'm a ditz (which is true, I very much am), but I think at least the mention of this in-game resource during the Tutorial would help bring attention to it for any new players to join the community. EDIT: If at all possible, can they be made into functioning how certain NPCs do? Where it has a scroll-over icon that you can click and your character will run up to it to further help distinguish them from something just in the background, please?... And to give it a location in the actual game world, maybe as a static location or a book your character can purchase from a merchant like Zeo? The reason I request the last bit is due to the fact out there isn't any way to return to the Tutorial area as of right now so anyone who wants to read these can't (if Zeo doesn't work, maybe throwing them in the Mage Guilds could). 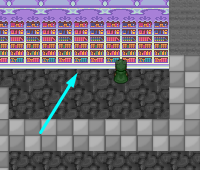 This was pointed out originally in Skullcat's guide for new players on the wiki, giving information regarding that the book shelf is clickable and gives info on most things. 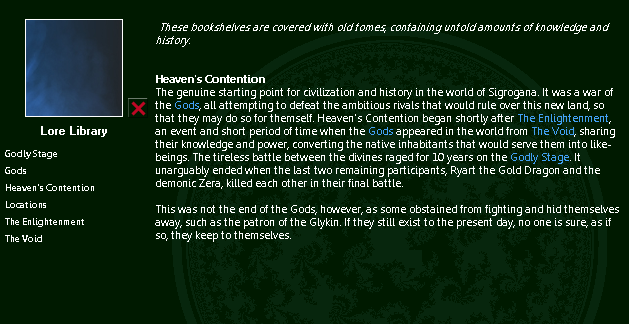 Dezark wrote: This was pointed out originally in Skullcat's guide for new players on the wiki, giving information regarding that the book shelf is clickable and gives info on most things. Would still be nice for it to be mentioned by Pink but oh well.